(Nanowerk News) A new look at Hubble images of galaxies could be a step toward illuminating the elusive nature of dark matter, the unobservable material that makes up the majority of the universe, according to a study published in the Monthly Notices of the Royal Astronomical Society. 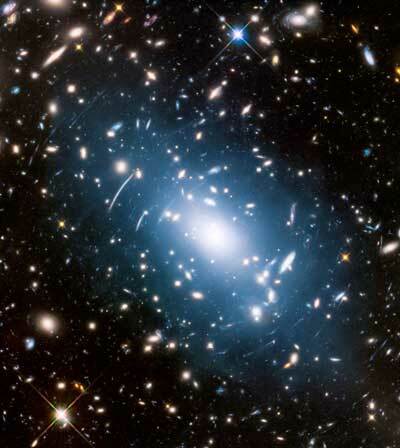 Utilizing Hubble's past observations of six massive galaxy clusters in the Frontier Fields program, astronomers demonstrated that intracluster light -- the diffuse glow between galaxies in a cluster -- traces the path of dark matter, illuminating its distribution more accurately than existing methods that observe X-ray light. "The reason that intracluster light is such an excellent tracer of dark matter in a galaxy cluster is that both the dark matter and these stars forming the intracluster light are free-floating on the gravitational potential of the cluster itself -- so they are following exactly the same gravity," said Mireia Montes of the University of New South Wales in Sydney, Australia, who is co-author of the study. "We have found a new way to see the location where the dark matter should be, because you are tracing exactly the same gravitational potential. We can illuminate, with a very faint glow, the position of dark matter." Montes also highlights that not only is the method accurate, but it is more efficient in that it utilizes only deep imaging, rather than the more complex, time-intensive techniques of spectroscopy. This means more clusters and objects in space can be studied in less time -- meaning more potential evidence of what dark matter consists of and how it behaves.